I'll briefly review...After panel lines are drawn, you are ready to begin applying © . Using 1/4 and 1/8th inch wide 3M Fine Line© tape, (not 3M Painters Tape) apply a single strip per side to the "outside" of a "single panel's" perimeter. On tight curves use narrowest width tape for best results. Remember, you are covering your plane one panel at a time. © can be applied directly from the roll without additional finishing process or it can be sanded to a super smooth natural and polished to a mirror finish. © is initially applied to panels along what is identified as the largest contact patch. Identify patch easily by placing a 6 or 12 inch plastic ruler on its thin edge in center of a masked panel and rotate it around a single point. You will observe there is a larger contact patch between ruler edge and panel surface. It is along this contact patch you are to initially apply ©. Below is an illustration of a contact patch as it may appear on a panel. Rarely is a patch parallel to a panel side. Remove paper backing from © and lay it across the taped panel perimeter. Press firmly with your index finger along the line of the initial contact patch. After traveling the length of the initial contact patch begin pressing out of the contact patch center and along its edge at right angles to the line of the initial contact patch. Continue until you reach the perimeter of the panel. Using gray end of the Sharpie© included with AK © firmly burnish against the 3M Fine Line© tape. 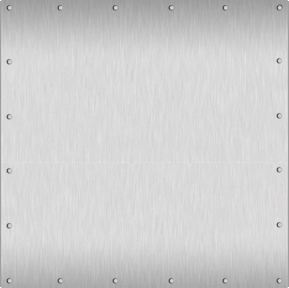 When the piece of aluminum is large it is easier to align the cut piece with the panel shape after you lightly spray aircraft panel interior with Windex© to permit aluminum to be "floated into position" similar to a decal. Remember a little Windex© goes a long way. As you burnish you will press the Windex© out from under the aluminum.